Xyience Energy Drink is a zero calorie carbonated energy drink and is made with all natural flavors and colors. All of their energy drinks are sweetened with sucralose (Splenda) and Ace-K and all standard flavors have the same caffeine content. Xyience reformulated their original energy drink from 200 mg of caffeine per 16 floz can to 184 mg and then Xyience was acquired by The Big Red Soda Company and reformulated again to 176 mg per can. Since Big Red took over the brand they've ended their partnership with the UFC and simplified their product line. Xyience also makes a range of bodybuilding supplements in addition to their energy drinks, which can be found in gyms across the US. Xyience Energy Drink is intended for adults only and isn't suitable for children or those sensitive to caffeine. Welcome to the America, where no extreme sport can exist without an energy drink to sponsor it. Take mixed martial arts fighting, for example. If you've never seen such a fight let me assure you, it's an extreme sport. Blood is often spattered all over the mat, tastefully decorating the Xyience logo that adorns the floor of pretty much every MMA fighting ring I've seen. 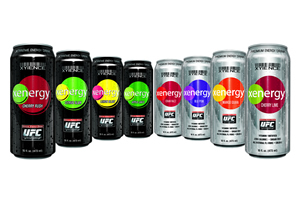 So what does Xyience, the official energy drink of the Ultimate Fighting Championship, know about making energy drinks? Surprisingly, a heck of a lot. Xyience gifted me 6 different flavors of their Xenergy drinks, although they offer more flavors than that. I can confidently say I've tried them all, but I will only discuss the drinks sent to me. Why you ask? Because it's been forever since I've had an Xyience drink. Now stop interrupting me. Out of the six flavors, three of them deliver a roundhouse kick of flavor that will put your taste buds into submission. The other three, well, still need a lot more training to land a successful hit. The three champs? Cherry Lime, Cherry Rush, and Apple Jak'd. Most notably, the cherry variants are absolutely wicked! A tart yet wholesome cherry experience is right up front and fades only naturally as you swallow. Cherry Lime and Cherry Rush are the tastiest Xyience drinks I have ever laid my tongue on, and deserve a top 20 spot in my all time list. Apple Jak'd isn't quite at the level of the two cherry flavors, but common, it's APPLE! When have you seen an apple flavored energy drink that tastes wonderful? Honestly. This is a very unique drink. The other three I wasn't so fond of are Citrus Slam, Lemon Blast, and Cran Razz. Cran Razz was one of the first flavors from Xyience and hints at the approach that Xyience took in the beginning to set their drinks apart from the rest. The first Xyience drinks were unique for astonishingly clear, crisp, light, and refreshing experiences. Think Fresca and you're basically there. The new Citrus Slam and Lemon Blast flavors, however, seem to have lost respect for their elders. Their tastes are as far away from refreshing crisp as you can possibly get. Complete opposites, in fact: muddling and mushy. These beverages have the making of a strong contender. Be ready for over 300% of your B vitamin values, guarana, and about 200mg of caffeine. So do these drinks deliver an aggressively obvious right hook, a sneaky yet powerful spinning back kick, or are they just an annoying kick to the shin? I'd have to say, with much joy, that these drinks act more like the right hook. Don't expect to have your reality tossed into a wood chipper, but do expect to be shook up and pointed back in the right direction to continue your day. If you see these solid energy drinks on a shelf in your travels, do not be afraid to give them a go. I have to say, though, with some remorse that you should not delay because it seems that Xyience is going the way of the dodo. They're simply disappearing out of stores. My local GNC store owner says he cannot even order them anymore, and Xyience is not making appearances at trade shows. Word has it they exist mainly in Las Vegas now, which is ground zero for the UFC. Xyience, I wish you the best of luck in keeping up with the competition! As strong as the rear naked choke may be getting, don't tap out! How Does Xyience Energy Drink Compare? Xyience Energy Drink contains 11.00 mgs of caffeine per fluid ounce (37.20mg/100 ml).